A man fights alzheimer disease to retrieve memories of his past. His lips formed the words of the old tune so familiarly that the abrupt lapse of memory fell sudden and heavy upon him; the succeeding words fell away into the empty darkness of his thoughts. Anxiously searching for the tune’s lost thread, he clutched the armrests of his chair, but the lady in white—the one who always called him sweetie—interrupted. Her weighted presence hurried by, stopping to place a shiny object on the flat wood next to him. She passed him, and moved in an accelerated lightning bug style—more lightning than bug—through a mass of people inhabiting the center of the room. A television screen held the attention of some; others stared out the large window or slept. He sat alone in the dimness of the room’s edge beside the flat wood, his hands rubbing themselves while his forehead shriveled with concern. The television rambled, and the people invading the center melded into a cloudy chaos. Human features popped out of the effervescent gray vapors. Their presence disrupted his concentration. In a click of the television’s remote, he abandoned his pursuit for the words to the song as he nervously searched among the others for a face he knew. Ryan’s recognizable smile was impossible to overlook, even in such a haze. But these faces only served to confuse him. Ryan not among them. All strangers, his baffled focus fell upon the flat wood and the silvery object resting there—a glinting spoon. Sunshine reflected off the shovel’s clean blade. The room’s glow alit on the spoon’s metal. Gazing into the dull light, he saw the room reflected within its silver concave as the words returned unbidden to his lips. Within the shiny surface, other images appeared. The shovel slammed down heavily, and bit into the soil. His Father’s thick fingers grasped the tool; right hand clasped the handle and jabbed downward, left hand pulled up on the fulcrum. Each movement in accord with the heavy shovel, designed to form a dark hole in the ground for the young apple tree. The house stood through the copse behind his father like a fairyland. His small hand clutched the slim sapling with its twisting roots exposed. The roots formed lines, tangles, and intersections; like pathways lost themselves within a greater mass of tree, earth, and confused solidity. He nervously awaited his own task. Would father be pleased? Father’s creased forehead and uncompromising eyes presided over him as his adolescent hands worked the soil and covered the roots. He looked up. Father nodded once. “Good,” father said. His heart floated skyward in company with the praise. Looking up from his contemplation of the spoon, he was surprised to see her sitting there across the flat wood from him. Maybe she’d just arrived. Maybe she’d always been there listening to his song. This disturbed him—his vacillating awareness of her—but her solidity, whenever he encountered her, both thrilled and calmed him. Her appearance damaged, once again, the thin connection he had to the song. The melody slipped away unacknowledged as he studied her. Her face, reminiscent of so many experiences and indicative of several other versions of itself, appeared distinctly familiar even habitual to him. But what was her name? Behind her stood the large picture window. Occasionally, the room’s other occupants shuffled through on flimsy legs or rolled by on metal chairs like shimmery ghosts. The window gazed out on a lonely line of bleak, leafless trees sparking a memory that fizzled before he could grasp it. Gray afternoon approached dark evening. A chill caught hold of him, and for a moment he teetered on the edge of hidden terror. Abandoning the window, he looked back at her. She remained undisturbed, intent on him alone. “Hello,” she said, and her voice aroused excitement. “How are you today?” She spoke with a smile that somehow seemed alien; it was one thing about her that he didn’t recognize. “Good… It was good, oh boy! I planted it… Father was there….” The words escaped him like water spitting from a crack in an old garden hose. Wishing to continue but unable—no language presented itself to convey his message—he nodded instead. Her implacable smile remained but tightened at its edges. Despite that smile, the familiar face thrilled him. He sang to her. He delighted in her attention. And then she laughed and held his hand leading him through the spring-lush copse to the just-burgeoned apple tree. The tree’s sweet aroma engulfed them as they ducked their heads under a flowered limb. When they straightened their necks, he examined her. She seemed so tall and her legs—silk-stockinged and long ending in shoeless feet mysteriously beautiful through the gauzy material. She noticed his admiration of her. Laughter erupted again in the form of nervous giggling. Her face reddened. But incongruous to her seeming embarrassment, she took his wrists and pulled him under the sweet smelling branches of that tree into a deep shade, and he imagined himself encased in the silkiness that covered her extensive limbs. He let her guide him, his innocence obvious. A spring’s gentle breeze stirred inside him. His sensations felt conjoined with the tenderly swaying pure-white petals above. He looked up. Tiny blossoms and light shimmered through brown branches like a brain’s electric connections, and he squinted through that brain and caught the sun in his eye as it glinted off a spoon in his hand above the flat wood. The lackluster shine a small fraction of the brilliance emanating through the brain-tree. A different version of her watched him now. He knew her so well. He squeezed the spoon, and it pinched his fingers painfully. 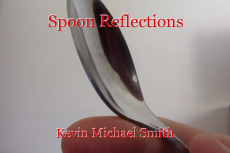 Looking down at his hand, he noticed a face within the spoon gazing back. At first, he thought Ryan was coming home. His heart quickened, and he leaned his head closer to the spoon as the face widened. But the face in the spoon’s bowl, upside down and squinting, appeared too old. It reminded him more of his own father, unforgiving eyes and creased brow. “Cal…” Her address surprised him. How long had she been there? He met her gaze. She had laughed pulling him down. “Your father died a long time ago”. The meaning of her statement seeped into his awareness slowly, it was more the face she displayed that centered him, allowed him to mull over his reaction to her news. Surely his father wasn’t dead. They’d just planted that tree. He seemed to recall a lifetime with her, episodes of existence shared between them, Ryan included. But had so many years passed, been lost in time and in mind? Hadn’t he and his father just planted that tree? He looked back into the spoon at the frowning pout. The unpleasant expression facing him could only be the distinctive features of his father’s severe visage. “No,” He told her almost disappointed. “It’s all upside down.” He held up the spoon, offering it to her. She sat there smiling at him, but her eyes didn’t smile. She’d always been tall. Everyone had always thought she was taller than him, but it wasn’t true. “Snack time!” The white lady’s voice emanated from some hidden corner of the room. His reaction startled him. Immediately his body responded to the words with affirmation; hungering with such forcefulness, it contracted in anticipation. Annoyed by this distraction to his thoughts, he experienced a feeling of disgust scoffing at his body’s ridiculous response. At the same time, it embarrassed him, shamed him, to feel the need for food with such fervor, especially while she watched. Yet his arms pushed down upon the chair’s armrests, and his legs began to straighten themselves. Although it belittled him, he couldn’t resist his compulsion to stand. But something blocked his upward movement thwarting an attempt to rise. Peering down, he saw a metal chair. Ryan, eager to help, leaned over him with a steady flashlight. But the white bar refused to budge. He couldn’t believe failure would occur at this moment, while she sat watching him. His desire to impress her made concentration on the task even more difficult. His demeanor changed, agitation showing on his face. “Are you hungry?” she asked him. He only looked at her again as he fumbled around with his chair trying to understand why he couldn’t release the mechanism, and set himself free. “Shine the light over here,” he directed Ryan. He wanted freedom. He would tell her but he couldn’t find the words. What was her name? Feeling trapped he fought with the chair for his release. He was disturbed by his inability to approach her; the distance between them struck him as odd and unnatural. It seemed that he should be able to stand and walk toward her if he wanted, but he was confined. He jerked the plastic bar upward over and over again. It slapped against the chair’s metal making a clinking sound like dull chains. At the edge of perception, he heard the white lady offering refreshments. The world verged on disruption. His hands wrenched the bar more forcefully. In the midst of the metallic rattle, she began speaking, slowly at first, but soon with conversational ease. Her words held a soothing mellifluous magic, and after a moment, he began to settle down forgetting his endeavor for liberty and relaxing into her steady voice. Every now and then, his desire for release rekindled, but her oration extinguished the flame of his efforts. He slowly lost himself in the enchantment of the words. She talked of people she seemed to think he knew. She told him how the Andersons had had flooding in their basement and the amount of money it had taken to clean it all up; she described a trip she had taken with her sister to Atlantic city where she had won 12 dollars and eaten lasagna at a nice Italian restaurant on the way home; she went on to tell him about clothing drives, changes in the weather, a new building going up in town, and more. He didn’t follow all she said—couldn’t quite grasp the meaning behind her feminine ability for discourse. But, occasionally, he felt compelled to answer her with a response: ‘You don’t say?’ or ‘is that right?’, uncertain if his tongue and lips actually produced any sound. Unchanging features remained upon her face. The stale smile never wavered, even as she spoke with a vocal elocution mesmerizing him so deeply, he let go polite responses, imagined or no. His song returned to him, harmonizing with her words in his mind. In the middle of her talk, he opened his mouth to add his voice to her tune. He sat alongside Ryan under the apple tree, their backs against the tree’s stout trunk. “Here’s some applesauce,” he heard the white lady say. “Thank you,” the she answered, pausing her conversation. Beside him Ryan’s head leaned over and lay upon his arm. Ryan felt warm against him. She reached for something on the flat wood. “Look Cal, applesauce,” and she returned to her gentle flow of melodious, meaningless words. Light glinted off a silver surface like sudden sunlight through a moving tree. The applesauce entered his mouth and banged into his taste buds disrupting his vision and sending his eyebrows sharply upward. His throat emitted a delicious Mhmm. The soft, pungent sweetness of the sauce disharmonized with the crunching apple that Ryan joyfully devoured. She hadn’t been there under the tree as autumn arrived. Now, she stood over him administering dessert as if it were medicine. She continued to relate, in her gentle and mesmerizing way, any small piece of information she could think of, any tidbit of simple life to sedate him with. He ignored her words, eager to utter his own dialogue. He possessed an awareness of her—what was her name—that made him certain she’d want to know about that moment with Ryan under the apple tree. He knew the revelation of such a small but touching event in Ryan’s life would be an unexpected, but precious gift for her as the fallen apple had been for his son. But unwanted applesauce kept coming. Falling fruit. Each time he finished swallowing and opened his lips to describe the scene, she delivered a new spoonful of dessert. Stretched smile. His tongue delighted in the taste. His jaws worked to chew. Matching blue. All the time, words tumbled from her into the air around him, language striving to dull his determination. He struggled against the onslaught of her words, and dessert, fortifying his grasp on this single memory. Her once soothing words became noise pollution, sounds of traffic, car horns blasting away at his thoughts, bombs exploding against memory, shrapnel distraction. He clutched at the memory but it shifted even as he held it. He swallowed another sweet glob but then ceased to comply, tightening his lips with assertive refusal like a readied soldier. Ryan smiled from the departing window. Suspending in the air above his nose, the applesauce willed him to part his lips, extend his tongue, accept its deliciousness. He continued to refuse. The bus disappeared into exhaust and distance. “Finished already?” she asked, with her unreal smile taut across her face. No! He was not finished. He hadn’t yet begun. He shook his head vehemently holding onto the scraps of his thoughts with fervent determination. She seemed to struggle. The smile fought to remain intact. Hostility halted her speech. The spoon and container dropped from her hands landing with a clatter. Tiny particles of spat applesauce stuck to the sleeve of her blouse and littered the flat wood. With controlled movements, she turned away, looked through the window into the barren night outside; the smile melted, forgotten. He hadn’t meant to offend her, but his energy had surged within him uncontrollably. He wanted her to reconnect, wanted her eyes upon him still. “Hey…” Her gaze remained stubbornly intent on the bleak, colorless landscape outside the window. He reached for her, but she moved away from his outstretched hands returning to the wooden chair where she continued to examine the outside world. If he could have remembered her name, he would have called her by it, used it to garner her affection. “Hey there…” he said to her unresponsive shoulders. Implacable disconnection extinguished his original intention; all concept of the rediscovered memory dissipated, dispersed, disintegrated into impenetrable darkness. Had he succeeded in attracting her attention, he would have had nothing to offer her. What had he been trying to tell her? Because he’d lost the core of his thoughts, he continued to examine her, watch her watching but soon her absorbed focus drew him in. He found himself inspecting the window’s scene. Because the sky had turned ebony, the window revealed the line of shadowy trees outside while also reflecting the room. The two worlds juxtaposed, causing ghost-like figures to move among bare, brittle branches. Other visions began to appear. Bellow the dance of half-seen wraiths, he discerned Ryan’s separate, less spectral form walking down the path away from him into the overgrown copse. Although the sight exhilarated him, dread lay somewhere within it. Not wishing the display to continue, he attempted to turn from the glass, but the power of his son’s incarnation in the window held him more surely than the white bar locked across his chair. No tune emerged from his lips. Through the window, his son began to disappear into the line of trees. No longer able to see clearly, he tried to stand. The ensnaring structure of his chair held him down. With delicate determination, he began to twist his body in a concentrated effort for release. All the time, he focused on the window’s double image; Ryan had now moved deep into the trees, no longer discernable within the wood. If he could bend his legs in the right configuration, he could detach himself. Then, he’d pass through the window and follow his vanishing son escaping from the coming doom and remaining with Ryan within the reflective surface. But this time, he felt the memory slowly swell like a recent wound. If he could have compressed it, covered it with a well-dressed bandage, he would have. But it intensified, demanding him to bear its evocative manifestation. Snow lay upon the ground contrasting with the stark brown of the trees. The usually clogged copse stood desolate. He could just make out the similarly austere apple tree. The air turned colder. Through the distracting lens of the thicket, he could see the tree, its branches as empty as the winter around him. He stood alone beneath it and a gray sky. The chair rocked dangerously. Despite the plastic bar, he had somehow twisted and manipulated his body into an awkward, upright position. His arms reached out toward the impenetrable shoulders of his wife. She still examined the vacant landscape, her attention never returning. His fingers shook as he extended them to their furthest reach. Focused intent shifted the cloudiness, and into its vacuum something like clarity bloomed rearranging the room and people around him. “Alice,” he called in a feeble voice. The chair teetered. Somewhere in the room, the nurse looked up from her daily tasks. Alice turned. In an instant, she was up, moving around the table, and beside him again. Alice’s arm wrapped around him. He leaned against her. She released an invisible catch, and his waist came free from the white bar as it unhinged. He fell into her slightly. The nurse advanced forward. He pressed his face into her body to block the windows wide-open glare, the visions he had seen there disintegrating into the night. There were no memories left that he wanted to relive, no music from his lips. © Copyright 2019 Kevin Michael Smith. All rights reserved. Not an intentional trap. Thanks for the read and the reaction. You took a very real problem and were not afraid to explore the real horrors of it. Really well-written and tactfully handled. Excellent work! Hey, thanks. Sometimes you have to wonder if anybody is getting anything from what you write... I really appreciate you taking a few minutes providing your thoughts. Do you have anything you'd like folks to check out? Can't say anything that hasn't been said, so I'll just say, "Great Write!" Thank you so much for giving this and the poem a read. I appreciate it and your kind words.